Zoric, G.; Engström, A.; Barkhuus, L.; Ruiz-Hidalgo, J.; Kochale, A. The appearance of new immersive TV content has increased the interactive possibilities presented to the viewers. Increased interactivity is seen as a valuable feature in viewing richer television content, but new functionalities are limited by what can be done naturally and intuitively using available devices like remote controls. Therefore, new interaction techniques, such as visual gestures control systems, have appeared aiming to enhance the viewers’ viewing experience. In this work we begin uncovering the potential and challenges of gesture interaction with ultra high definition video for people watching TV together. As a first step we have done a study with a group of people interacting with such content using a gesture-based system in the home environment The appearance of new immersive TV content has increased the interactive possibilities presented to the viewers. Increased interactivity is seen as a valuable feature in viewing richer television content, but new functionalities are limited by what can be done naturally and intuitively using available devices like remote controls. Therefore, new interaction techniques, such as visual gestures control systems, have appeared aiming to enhance the viewers’ viewing experience. In this work we begin uncovering the potential and challenges of gesture interaction with ultra high definition video for people watching TV together. As a first step we have done a study with a group of people interacting with such content using a gesture-based system in the home environment. Zoric, G. [et al.]. 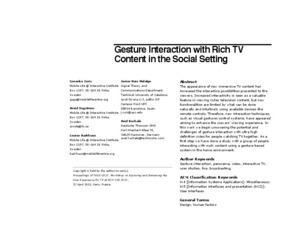 Gesture interaction with rich TV content in the social setting. A: ACM SIGCHI Conference on Human Factors in Computing Systems. "Proceedings of TVUX 2013: Workshop on Exploring and Enhancing the User Experience for TV at ACM CHI 2013: 27 April 2013, Paris, France". Paris: ACM, 2013, p. 1-4.